According to NPD's numbers, PS4 units sold in January almost doubled that of the Xbox One, with even the software sales showing a clear slant for Sony's console. While it's no secret by now that Sony's PlayStation 4 is outperforming Microsoft's Xbox One at retail, that gulf might be bigger than most people think. According to The NPD Group's numbers for January, hardware sales of the PS4 nearly doubled that of the Xbox One in the US, with Sony spokesperson Guy Longworth confirming the advantage, even if PS4 supply remains "severely constrained." Demand for PlayStation 4 remains incredibly strong as it was No. 1 in sales for next-gen consoles in January, nearly doubling the nearest next-gen competitor, and remains the cumulative leader, according to today's NPD report...Although PS4 remains severely constrained at retail, we are working hard to refresh supply as quickly as possible. Over in the software front, Sony managed to dominate that area too, with Longworth stating, "It's clear gamers are choosing PlayStation as the best place to play, with PS4 software sales ranking No. 1 in January, highlighted by strong sales of Tomb Raider: Definitive Edition, which sold twice as many units on PS4 than any other platform." Aside from Tomb Raider: Definitive Edition, the PS4 version of multi-platform games is outselling its Xbox One counterpart except for Call of Duty: Ghosts and LEGO Marvel Super Heroes. While both Microsoft and Sony have yet to reveal official hardware figures, estimates peg the PS4 sales at 280,000 units, with the Xbox One said to have moved 145,000 units in the first month of 2014. Keep in mind that these are US numbers. But then again, the story isn't all that different in the UK, either, with online retail giant Amazon confirming that the PS4 gap over the Xbox One is "quite a big one." 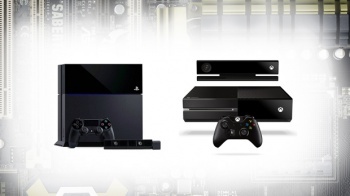 What steps should Microsoft take to catch up to Sony's PS4? Offer Xbox Live's "Games with Gold" service on the platform? Drop Kinect entirely? Or could Respawn's upcoming Titanfall be the game that lessens the gap?